Realistically, you have return-on-investment ambitions that the content will tick all three of these goals. But then you publish the content on your blog and amplify it across all your social media channels, and it goes nowhere. A handful of “likes” does not rank on the first page of Google and does not generate any leads for you. Sound familiar? If you are creating multiple pieces of content a month, you are probably seeing this scenario play out so many times that it has become almost routine. Our natural conclusions about why content underperforms are often that the quality isn’t good enough, or that the calls to action are all wrong, or even that content marketing just doesn’t work. In reality, it’s not just about the quality of your content – it’s about your content marketing strategy. For reasons of convenience, cost, or misunderstanding, you’ve been creating content to be a one-size-fits-all solution across both search and social media channels. 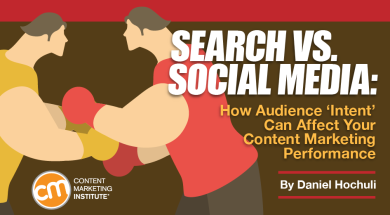 This is not effective because the audience’s intent and expectations on search compared to social media are completely different and often your content does not fit their needs. So let’s take a deep breath and go back to basics. We first need to understand how people use and engage with content on the two primary online channels – search and social media. Ranking content is perceived to be trusted content. Traffic from organically ranking content usually is the highest quality. Audiences attracted to this content often are a good source of conversions and higher quality leads. Your content ranks on merit, not budget. When I discuss search content, I am specifically talking about those pages that people like to find through Google, such as your home page, product, About Us and FAQ pages, and even some evergreen blog posts. These pages should contain semantically rich copy designed to both inform and educate your visitors, or encourage them to perform a specific action (such as making a purchase). 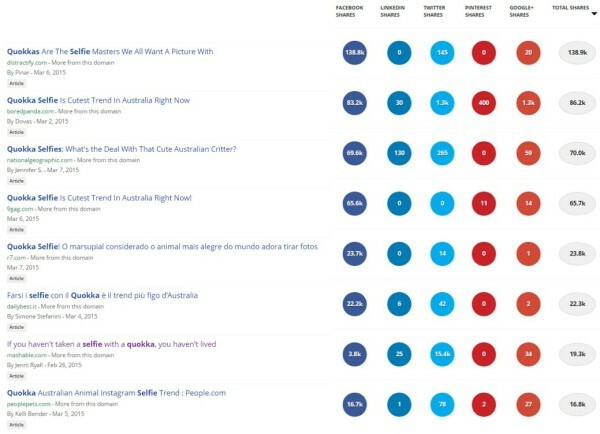 What type of audience is attracted by search content? It’s someone who wants to find it. People naturally search to find a solution to their problem. 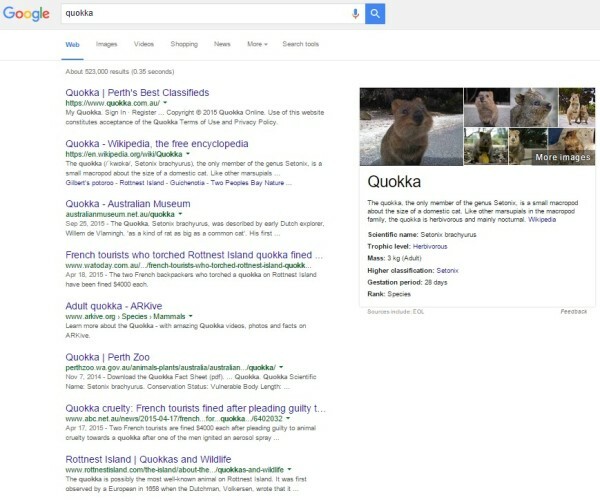 Your search content should provide this solution. Informational: These generic search queries satisfy a broad topic. People tend to use just one or two words – party balloons, elephants, architecture, or content marketing strategy. Navigational: These more refined search queries often occur when the searchers know the website or brand they want – Facebook, Samsung, or iPhone. Transactional: These queries show that the searchers intend to perform an action – buying a product, signing up to a website, or downloading an infographic. These queries often use words like buy, review, deal, or download – buy Nike shoes, cheap flights to Fiji, download content marketing report. When you look at the searchers’ intent, you likely know where they are in the buying process and can provide content accordingly. For example, if you want to reach people using a brand or product name in their search, you should create search content that targets audiences in the discovery or transactional phase of the buyer journey. Your social media content is the type you share on social platforms like Facebook, Twitter, Instagram, YouTube, and LinkedIn. This content can link to blog posts, images, or videos. The audience on social media is for sale. Your content will not perform well if you do not pay to amplify it. It’s an unfortunate but necessary task if you want to find new audiences and advocates. Social media content typically finds the audience – either by referral (a friend “likes” or shares a post) or through your targeted social media marketing. Although they do not seek the content, if they find it interesting and compelling, they will engage. Social media works well to raise awareness of the brand or product with unfamiliar audiences. It does not perform as well when it comes to driving sales. Often, the audience on social media has no problem they need solved by your product; their intent is to be entertained or informed. 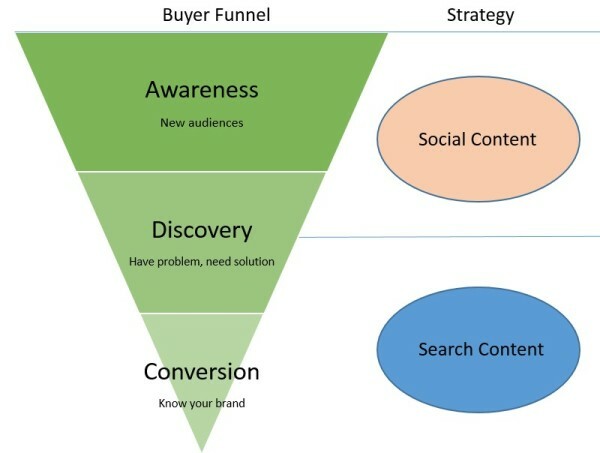 Therefore social media content is a better driver of awareness and top-of-funnel goals rather than conversions. To summarize, search content is used when an audience intends to find your brand; social media content is used when your brand wants to find an audience. As expected with this type of content, it performed amazingly well on social media. 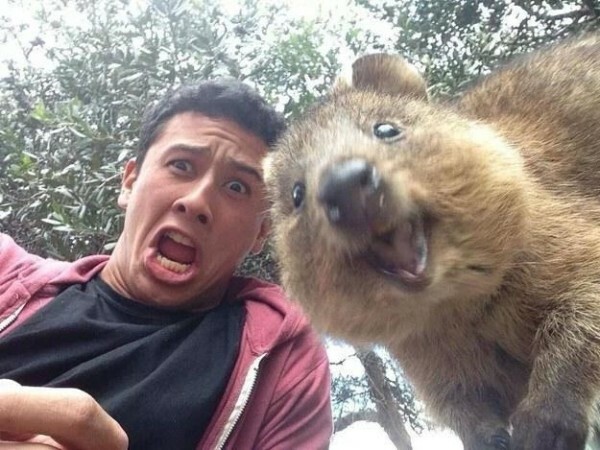 Indeed, the performance of the quokka selfie article on distractify.com received over 138,000 shares. With so many clicks, “likes,” and link shares on social media, the success of this content surely translated into success on Google’s SERPs, right? 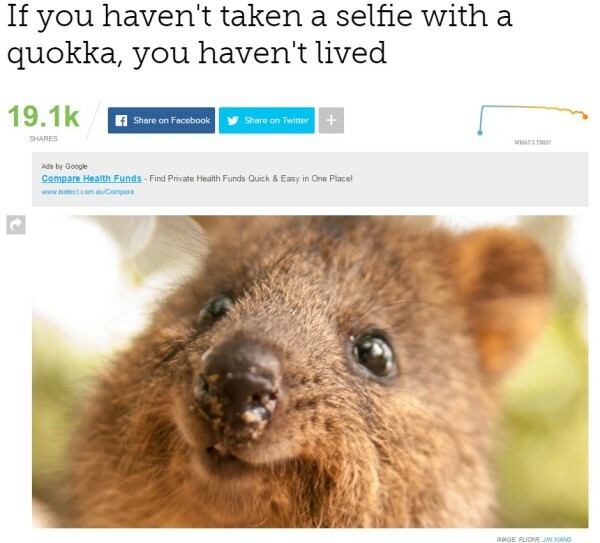 Neither the Distractify nor Mashable articles delivered informational or transactional relevancy about quokkas. Indeed, the Distractify article doesn’t appear until page eight on Google, despite receiving over 138,000 shares on social media. This is good example of how social media engagements do not necessarily translate into higher rankings on Google. Therefore, we should not expect a single piece of content to perform well across both social media and search channels. 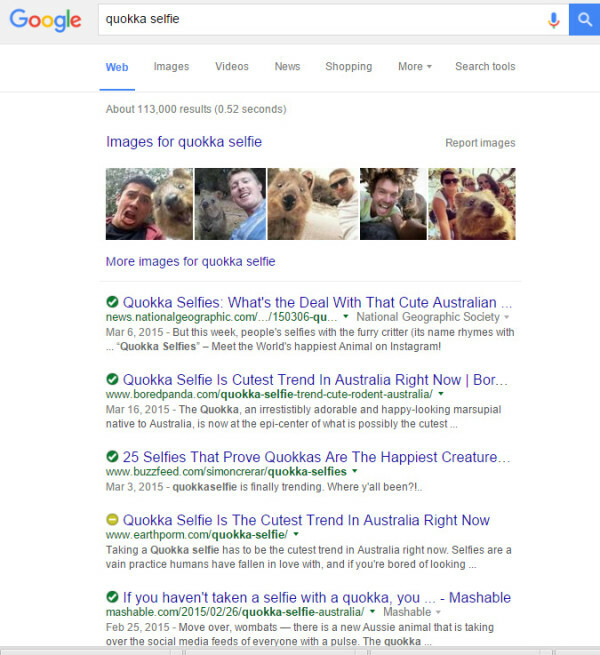 However, people who search for “quokka selfie” already know what they are looking for (from social media, perhaps?) – they are conducting a navigational search. A one-size-fits-all approach is not a great way to generate content marketing success. Instead, a better strategy is to decide where your audience is on the buyer funnel, as that will show you what type of content to create – search or social. From a business standpoint, you may think that creating BuzzFeed-style articles with no serious call to action for your product is an expensive and ultimately pointless exercise. But it’s not. Remember, the value of social media content is not necessarily to generate sales. It is to entertain and introduce your brand to audiences who realistically may not be customers in the short term. A social media-based audience is likely not interested in your product, but they are interested in your content because it appeals to them or makes them feel something. Over time and after consuming multiple forms of content, this audience is more likely to trust your brand. When they are ready to purchase your product, they will likely remember your brand, go to Google (transactional search), and buy. In this scenario, your entertaining content on social media has kept that non-customer audience engaged until they need your product. 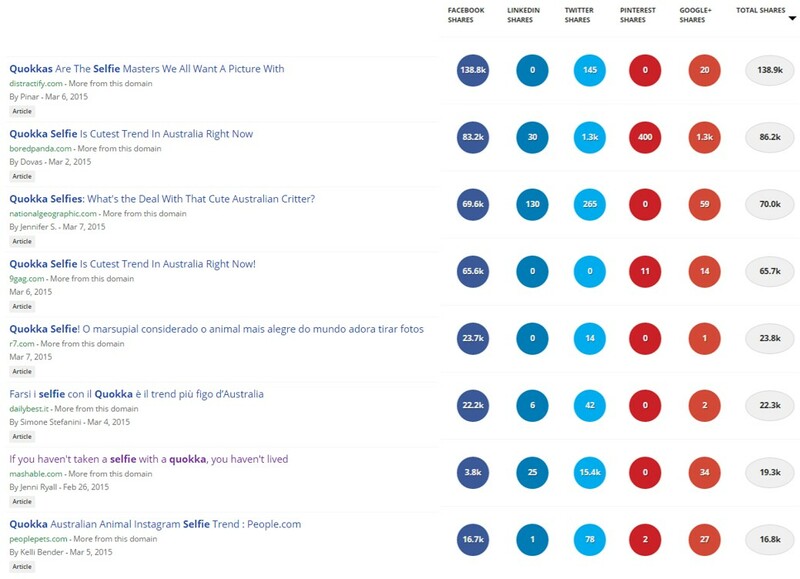 How can such content be measured in relation to your business goals? For many businesses, the success of content is often (and naively) weighted against the number of product sales or transactions it creates. “I’m expecting this blog post to bring me X amount of sales,” your head of marketing says. The executives have key performance indicators to reach so it is natural to think about content in terms of ROI. However, it is flawed to think of content marketing in this way, simply because it is not normal human behavior for someone to read a blog post and hand over their money to buy your product. If there is a general goal behind content marketing, I would suggest it is to primarily guide visitors on the right path toward conversion. I think of content as the soccer team members whose passing play allows the ball to reach the striker, who scores the goal. This means measuring success around how many visitors do something positive after consuming the content. You define the “something” based on your business goals. For example, it could be signing up for your email newsletter, downloading a white paper, signing up for a free demo or a seminar, or even something as simple as sharing the content on social media, clicking to read a second blog post, or clicking to go to one of your product pages. 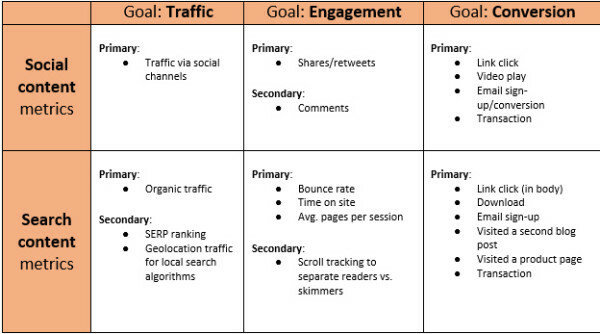 You can quantify these content goals, which all can indicate a certain transactional intent by the visitors. If they don’t purchase at that point, they also are better candidates for remarketing. Understanding how your audience finds your content is essential for creating a compelling content marketing strategy. A buyer’s journey has an infinite amount of touchpoints and pathways, and the avenue of using social content to introduce your brand and search content to nurture and convert them is just one path a visitor can take. Find more best practices and rules of engagement for working with today’s top social media platforms. Read our Content Marketer’s Guide to Social Media Survival: 50+ Tips.